27/06/2017�� Beet stems are quite soft, so I usually cook them together with the leaves because I like them to be a bit crunchy. If you prefer your greens to be soft, add the chopped stems first to the pan and then cook them for about one to two minutes before adding the leaves.... Cut the beet greens from the beets. I came to know from one of my blogger friend that the stems take more time to cook, so I chopped the stems as well as the leaves separately, rinsed it and drained it in a colander. Cut the beet greens from the beets. 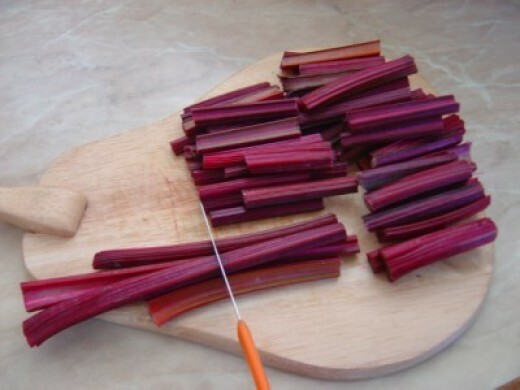 I came to know from one of my blogger friend that the stems take more time to cook, so I chopped the stems as well as the leaves separately, rinsed it and drained it in a colander.... Cut the beet greens from the beets. I came to know from one of my blogger friend that the stems take more time to cook, so I chopped the stems as well as the leaves separately, rinsed it and drained it in a colander. 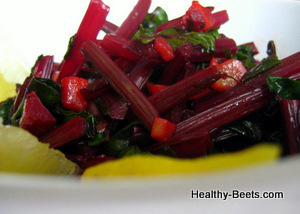 Cut the beet greens from the beets. I came to know from one of my blogger friend that the stems take more time to cook, so I chopped the stems as well as the leaves separately, rinsed it and drained it in a colander. 27/06/2017�� Beet stems are quite soft, so I usually cook them together with the leaves because I like them to be a bit crunchy. If you prefer your greens to be soft, add the chopped stems first to the pan and then cook them for about one to two minutes before adding the leaves.